Creating events on Facebook can be an effective, low-cost way to market your business event. But business owners may not get the sales and new leads they're hoping for if they overlook the many small details involved in event creation and promotion. Here's how to set up an event and what works best to promote it far and wide. How to set up your event: First, let's look at events as they appear to your Facebook fans. Click on the Events link in your homepage sidebar to see the calendar view of all upcoming events. These will include friends' birthdays, suggested events your Facebook friends have created and events you were invited to on Facebook. You can click on any event for more info, or to join or decline. 1. Click the Edit Page button at the top of your Facebook page. 2. Choose Update Info in the drop down menu. 3. Click the Apps link on the left sidebar to see all the apps you have available on your Facebook page. 4. Find the Events App and click the Edit Settings link. A pop-up box appears. 5. Click the (Add) link next to the (Tab: Available) text and then click the Okay button. 6. The pop-up box disappears and you now have the Event app showing where all of your apps appear on your Timeline. 7. Now you can click on the app and create your event. Where: Be specific -- if it's an offline event, give the exact address so Facebook users see a map. If it's online, say so. Time: Facebook doesn't show time zones, so you should note yours. Images: Create two -- a large, compelling image for the event page and a thumbnail for your event app. Extras: Don't check the radio button for "only admins can post on event wall," or attendees won't be able to ask questions or post on your event wall. When you create an event via your Facebook Page, there's no way to invite all your fans and friends with a simple click of a button. Facebook prevents that so you can't spam everyone with your event. Although Facebook doesn't have a feature for inviting your fans, you can invite profile friends with the "invite friends" button on the event page. In addition, you can promote your event to your fans with ads and Timeline posts. How to promote your event: These strategies can help maximize lead generation and sales. • Share the event on your Timeline with a call to action and a compelling image. • Create a registration page (or sales page if it's a paid event) outside of Facebook. 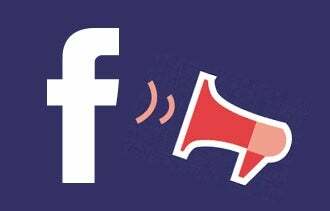 Then you can direct your Facebook fans who are interested in your event to a site where you can talk more about it, add more photos and branding elements, and most important, capture leads from your registrations and RSVPs. • Involve your other presenters by tagging them -- and asking them to talk about it. Try giving them some posts with images, information and links. • Promote until the very end. Keep your fans updated on new speakers, registration information, discounts and maybe teasers of what's to come through frequent Facebook updates right up until the event itself or the last call for registrations. • Turn some updates into Promoted Posts to snag more views. You can create a short promotional video or some fun images, teasing fans about the event. Videos and images always get more clicks than text posts. • Advertise the event. 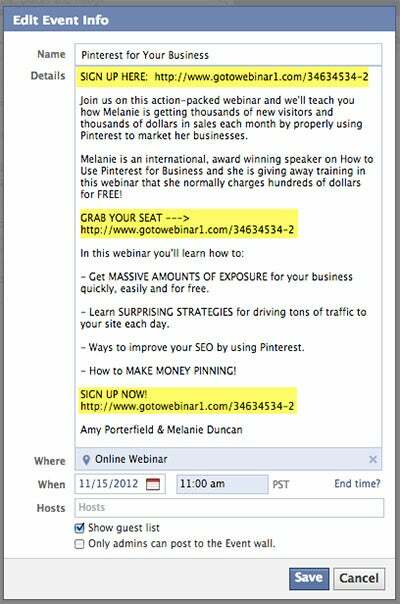 Turn your event into a Page Post Ad by clicking "export event" and creating an ad for your target audience. • Leverage your Timeline cover photo. You can't include a call to action on a company page image, but you can create an eye-catching, branded Timeline photo.